The Softclix-R lancing device has a number of features which make it one of the finest new lancet devices that is currently available. 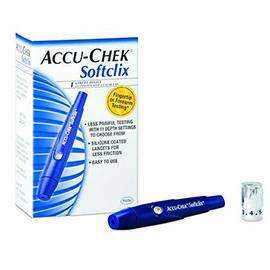 After you have heard some of the details about this excellent product, you will surely decide that it is the lancing device for you– and once you have tried the Softclix-R, you will know that you have found just the right device for for your blood-drawing needs. What could possibly make any one product so ideal for helping you to manage your diabetes? Let’s look at some of the features provided by the Softclix-R! For the best possible management of your diabetes, owning a product which will allow you to draw your blood samples as frequently as necessary with the least amount of discomfort to you is one of the most significant factors. The Softclix-R is specially designed with this purpose in mind. As it is complete with eleven different settings, each person who uses a Softclix-R will surely consider it to be the most comfortable blood-drawing tool that they have ever used. Many diabetics have had the difficult experience of their device breaking. When you have a Softclix-R, there will be far less worry about this problem, because it is made to be more sturdy and more durable than most other devices. Not only is this feature helpful in the everyday use of a Softclix-R, it also makes carrying and storing the device safer and easier than one that could break, crack, or even fall apart. The Softclix-R is not only newer, it is most definitely better! As general safety is often a concern with the process of blood-testing, you will also appreciate the special feature of the Softclix-R which will allow you to remove and dispose of your used needles without having to touch them. Although this is a great feature for any diabetic, it is even more important for children– they can take out the needle and dispose of it properly without it coming into contact with their hands, fingers, or risking the needle being dropped. Although some people may think this to be a minor concern, another feature to consider with the Softclix-R is that it has a nice appearance. Even the most sophisticated and fashion-conscious diabetics will not be embarrassed by other people seeing their device. If you routinely carry a pen, you can routinely carry your Softclix-R device– it is that discreet! Every diabetic has his or her own particular concerns and preferences when preparing to buy a lancing device. Whether your priority is comfort, safety, personal discretion, fine construction, or a combination of all of these all-important factors, it is likely that you will decide the Softclix-R is the ideal device for you. If all of these important features have not yet convinced you, all you need to do is purchase one of these fine instruments, and you are assured that you will be more than satisfied with your choice!